An Arrangement Of Multi-Colored Crystal Florals Sets A Lovely Theme For Any Decor. This Collection Is Set Apart From Others With Its Bold, Rich Colors Throughout, As Well As Vines That Seem To Grow Naturally In Various Directions. Notice The Crystal Tips On The Ends Of The Vines That Resemble A Drop Of Freshly Fallen Rain. Designed to showcase our many blown glass options. This collection utilizes a simplified frame that embellishes the shape and color of the glass. Finished in Dark Rust. The combination of wood and iron is a historic pairing of materials inspired by the early days of colonial America. Solid wood is either turned or milled to provide an understated hand-made character. The colonial maple finish compliments the Vintage Rust metalwork while the Wheat linen shades cast a warm glow of light. 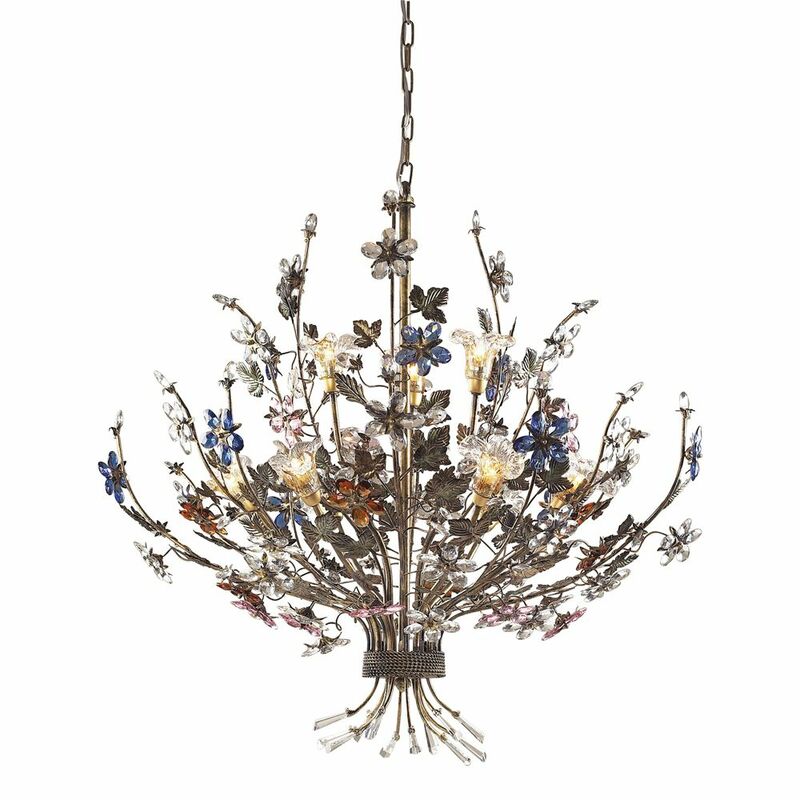 9 Light Ceiling Mount Bronzed Rust Chandelier An Arrangement Of Multi-Colored Crystal Florals Sets A Lovely Theme For Any Decor. This Collection Is Set Apart From Others With Its Bold, Rich Colors Throughout, As Well As Vines That Seem To Grow Naturally In Various Directions. Notice The Crystal Tips On The Ends Of The Vines That Resemble A Drop Of Freshly Fallen Rain.